Synopsis: Given the lack of snow this past winter and the generally awesome weather around the Bay Area, I decided that I wanted to start training for some triathlons this season. I bought a new road bike in January and hit to the streets – quickly realizing why the greater Bay Area is considered one of the best road biking meccas in the country. The hill climbing around the Coast mountains is incredible. Anyway, I signed up for my first ever triathlon – the Golden Gate Triathlon (Olympic Distance) put on by Tri-Freaks. The Olympic Distance was planned to involve a 0.93 mile swim, a 25.82 mile bike and a 6.17 mile run. Because of the hilly nature of San Francisco, the bike leg involved 2,919 feet of climbing! Fortunately, my hill climbing training really paid off in the end. Most importantly, I was able to raise $1,985 dollars for the American Cancer Society of California through generous donations from my family and friends. I really appreciate the support from everyone who donated for such a good cause! Ultimately, I was able to place #3 overall in the race out of a total of 87 competitors in the Olympic Distance. This also included placing #1 out of 26 in the male age group of 30-39. 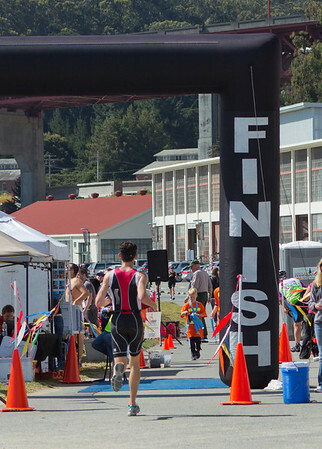 I was very pleased with the results for my first ever triathlon and plan on continuing training this summer for the 2012 Marin County Olympic Distance Triathlon in November.